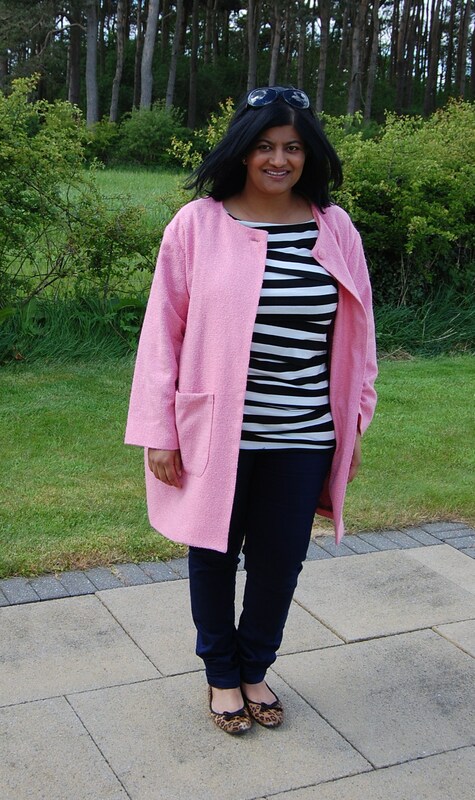 Today I am back to share a coat that I made using New Look 6248: what can best be described as an oversized, unstructured boyfriend style coat, which I made using a very sugary pink wool mix boucle. BTW, does anyone know what the exact difference is between boucle and tweed? I have tried googling the answer and still don’t know…I would love to hear from any experts out there. Anyway, here’s the deal: summer has not yet reached this corner of the world. I mean, we are barely breaking into spring. Yesterday we had thunder, lightning, hailstones, torrential rain and sunshine…in one day. So, I wanted a lightweight spring coat. Something to keep the chill away but not heavy. 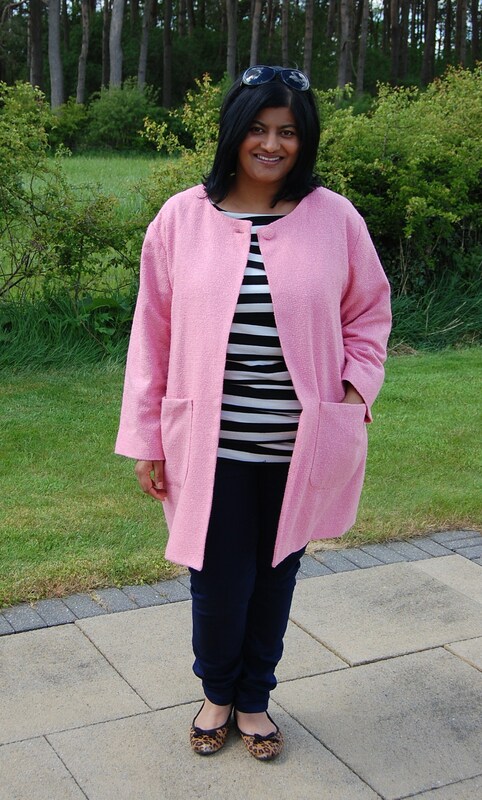 (BTW, you can see my spring coat from last year here – still enjoy wearing this). I picked this wool mix boucle? tweed? up in Glasgow when we were there during the Easter Break (purchased from Remnant Kings). I fully interfaced all pieces of this coat. 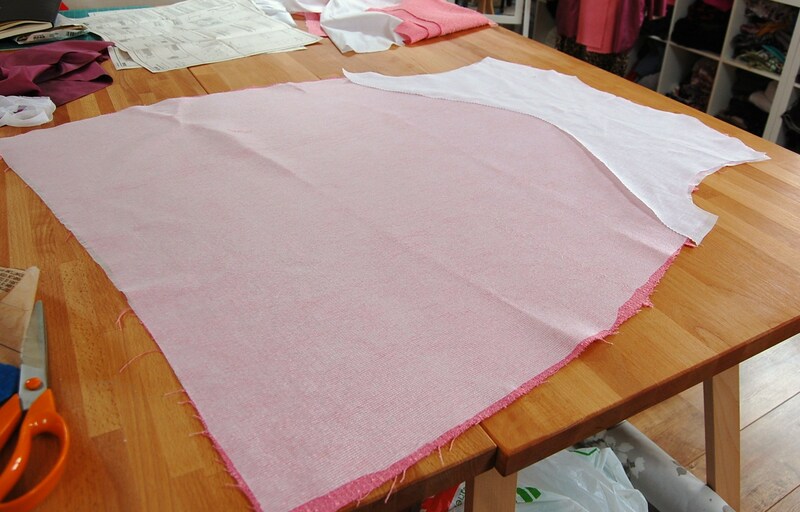 I did not block fuse, but cut each interfacing piece out separately (on grain) and fused to the corresponding piece. 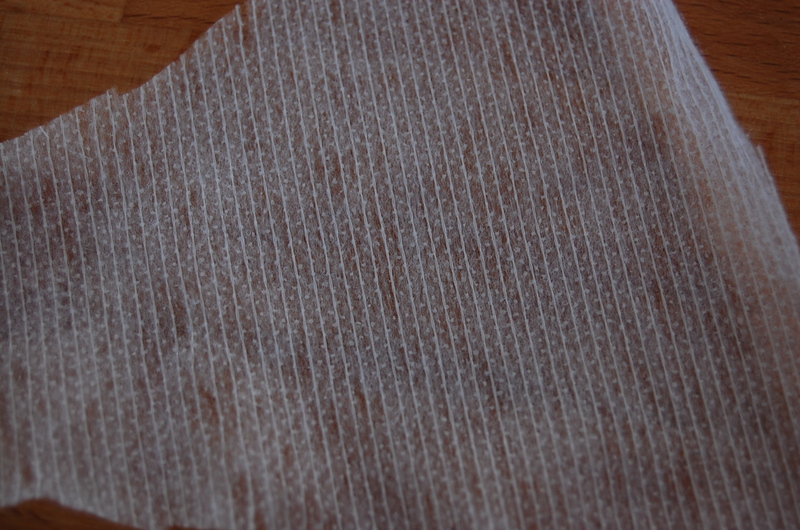 I picked the interfacing up from my local market. It was sold as “reinforced interfacing”, which, I was told, was perfect for fusing to unstable fabrics (such as boucle). Has anyone come across this interfacing before? I am including some close up pictures below. It is quite delicate and easy to pull apart so you have to be careful when handling it. I think it worked out ok. It made handling the boucle easier but didn’t affect the handle of the fabric. Does anyone have any better suggestions for interfacing boucle? I also pre-treated my fabric by steaming it with my iron. Reinforced interfacing recommended for “unstable fabrics”. The coat is fully lined with a viscose lining…I bagged my lining out (as I normally always do) and for once the instructions actually tell you how to do this! (Although I didn’t use them…I like Grainline’s instructions). I also included a back stay cut from some left over muslin. Everything else you want to know is in my review below – the thing you have to watch out for with this pattern is that it is drafted to include eleven – that’s right- 11 inches of ease. 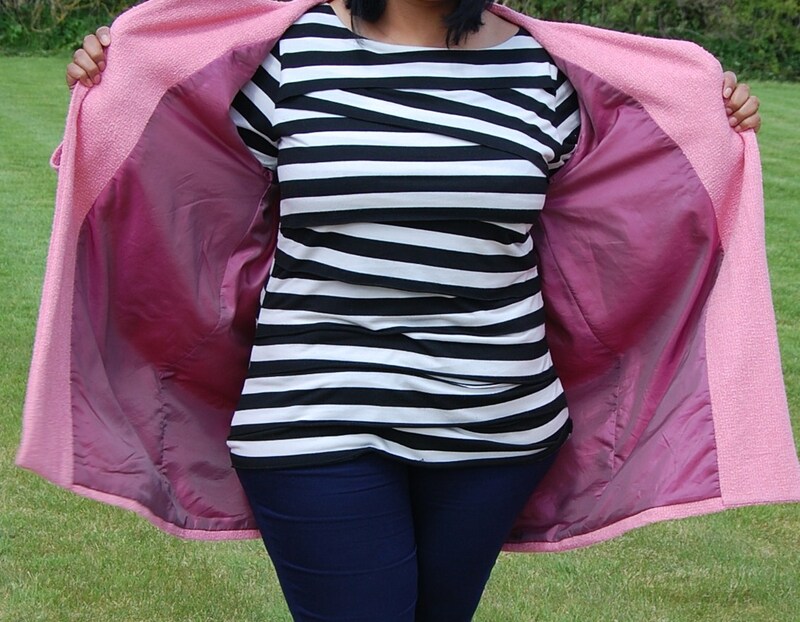 I went down a size and I am perfectly happy with the slouchy, drop shouldered fit. 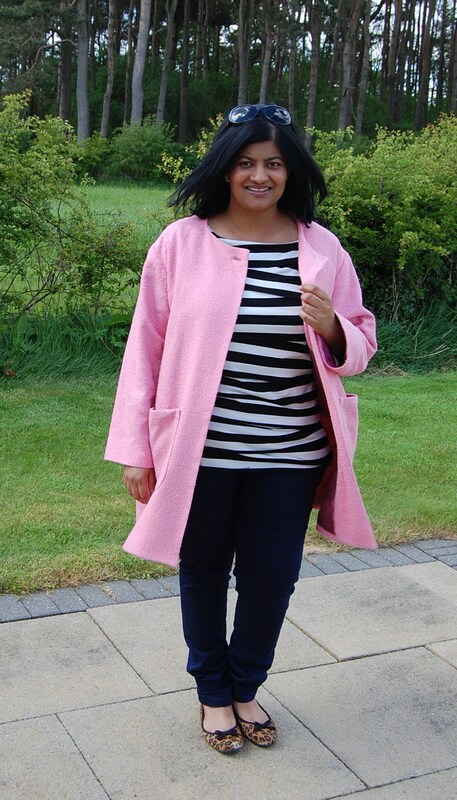 Interestingly, this coat was declared far too big by Phililp (husband) and my mother, and my brother – who never comments on what I wear or make – used the M word. That’s right, he said it looked like a Maternity coat! Hmmm….it’s a good job I dress to please myself 🙂 The one thing I am going to change though is the covered button. I don’t like it and have got a smart matt gold button which I will swap out later. 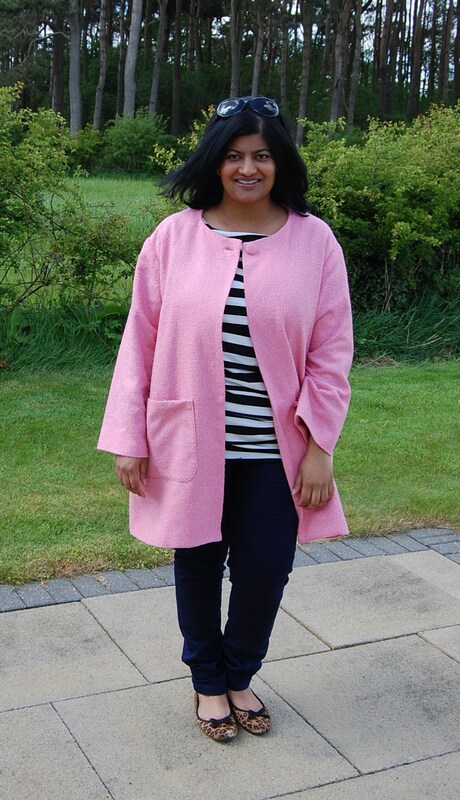 Misses’ coat with side pockets can have long or elbow length sleeves . For visual interest add contrast sleeve binding and hem. Coat can also have a deep stand collar and choice of one or three buttons. I made view C, the collarless view, with the longer length sleeve. Yes – they also include instructions to bag the lining out. Although I used the method I like (from Grainline’s blog). Well, I like the finished garment. Yes, it is oversized, drop shouldered, slouchy and unstructured, but I like it. There are 11 inches of ease in this garment so pick your size carefully. I sized down. 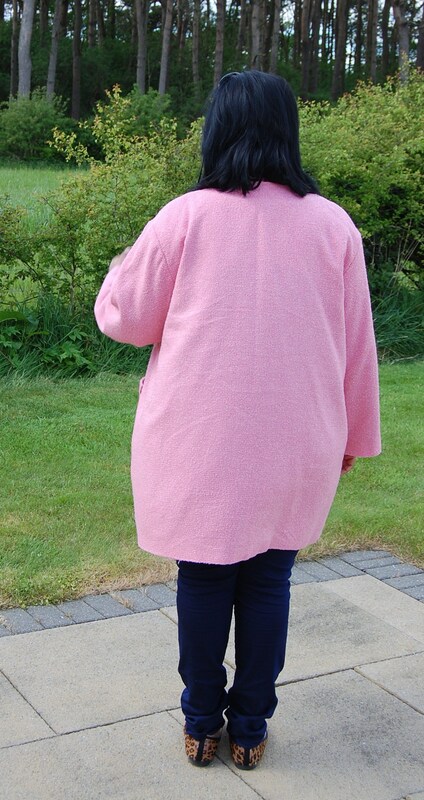 My husband and mother think it is far too big and my brother – who never comments on what I wear or sew – said it looked like a maternity coat. I don’t think it is too big. I like the fact separate lining pieces are included. Nothing I disliked as such. I am going to change the covered button for a matt gold one – I don’t like the look of the covered button. A wool mix boucle with a viscose lining. I interfaced all pieces of this coat using reinforced interfacing to stabilise the fabric and I am pleased with the outcome. I shortened the length by 1 inch. I added lined patch pockets. I added a muslin back stay. Don’t know if I would sew it again myself. One maternity coat when one is not expecting is enough 🙂 Yes, I would recommend it. I like this boyfriend style and I think this pattern offers some interesting options like the contrast sleeve and hem bands etc. So that’s it from me for now. Look forward to hearing your opinions on this one. It does feel a little like I am back wearing a lab white coat, hahaha. Seriously, I have already enjoyed wearing this coat and will continue doing so. Until soon…. I love this, might have to get the pattern myself, it looks great, well done! That being said, you made your coat, you love it, so wear it with pride! Thanks Anne. I won’t re-do this coat but that pattern you linked too looks like a good option if I wanted a more fitted option. I *lurve* that little jacket! It is funny that you don’t like the covered button as it was the first thing that caught my eye and I thought, “What a great detail, so Jackie Kennedy.” 🙂 The color sparkles on you and the I think the ease is just right. Your family’s reaction made me smile as I get comments like that all the time, heh. And yep, I’m with you, good thing it’s my closet! 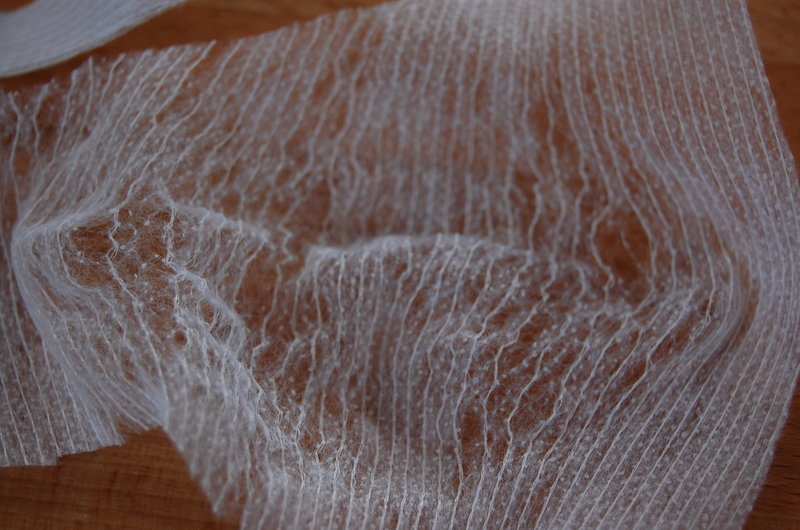 The stuff at the big box stores is always papery feeling and looks like a web of fibers that you can pull apart. It works to add body to something, but it doesn’t make the fabric any stronger if you can just pull it apart like that! I think it’s funny too that it has those long threads in one direction to make it look more like weft insertion interfacing. Thank you Jamie for a the info. Next time I will definitely look for the weft insertion type. When you speak about mystery interfacing, we have an array of these interfacings here like the one you were sold. Would you believe I’ve been looking for pale coloured fabric for a Winter coat, which I think is similar to what you’d call a Spring coat. The pale pink is a lovely colour to wear when the weather is being unusually fierce. It’s very uplifting. The good thing with coats is the ease is there for the layers you wear under it. I’ve made a tight coat and regretted it – but still worn it. If you enjoy wearing this coat, you’ll always smile when you wear it. PS. I love your stripe top! Thanks Maria. The top is a RTW one but one which I have often thought I could just make myself using that vogue Tilton pattern with the layers?! It’s a good choice top. My understanding is that tweed refers to the weaving pattern – a twill or herringbone weave. The word itself initially was the Scottish dialect for ’twill’, I think. Something like that, I didn’t google this bit so I’m hoping my memory is right! I think it has to be woolen, and it’s always closely woven. Boucle refers to the yarn itself – it’s two threads combined and one has a looser tension so it creates loops (it is french for ‘curl’. I DID google that bit to check!). So boucle fabric is any fabric woven out of boucle yarn, and it will have those little loops making a fuzz or other kind of texture, depending on how big the loops are. I’ve seen it woven tightly and also very loosely. I suppose you could technically have a boucle tweed! I love your coat! I think if it were mine I would feel like it is too big, but on you it looks so lovely and fashionable. And warm! I like the covered button but I think it will look extra fabulous with a gold one. Will you show us an updated photo when you switch it out? Thanks craftastrophies. Hmmm so maybe this is a boucle tweed?! Ha will ponder it. I absolutely love it! You have such an eye for fabulous shapes & fabric. I thought boucle had a loopy texture like you’d expect on a classic Chanel jacket, whereas tweed has a flatter weave…? Thanks Rachel. But Linton tweeds sometimes have a raised bumpy surface which got me thinking is it a boucle or a tweed?! Pretty in pink! Perfect colour for your spring coat. Yes, the “boucle” is the yarn, but it can also be the fabric woven from that yarn. It comes from the French word for “buckled” (as in “crimped” or “crushed”). Boucle yarn can be spun from any sort of fiber, though it usually contains at least some animal fiber. Even if the fabric is not a true twill, flecked color and rough surface can define it as a tweed. It is almost always woolen, though you can find some polyester tweeds. A boucle fabric may or may not be a tweed. A tweed may or may not be woven from boucle yarn. From the photos of your cheerful, rose-colored coat, I’d say it was made of a boucle but not a tweed, my ownself. But I am just one woman from central North Carolina. Eleven inches of ease is bananas. I LOVE this color. Like, love love it on you. And, it’s a perfect spring coat. Definitely not maternity. LOVE it!!! I want to get that pattern too! all that ease seems insane. But you look fabulous! I adore that color. No opinion on the fit of the coat, as the silhouette itself seems like it would look too big no matter how big or small you cut it! However, it’s quite on trend, so why not rock it? As for the button — swapping out the fabric-covered button for a gold one is a genius idea! Notions are what really kick garments up a notch. I’m glad you dress for you not them. I love your coat and it makes me want to make one for me. I like the pink button.